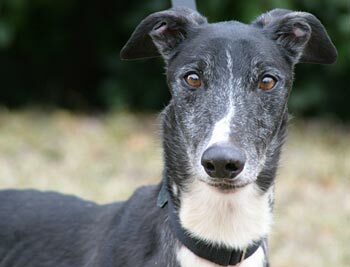 Snoopy, aka Kson's Snoop Dawg, is a handsome, 4½-year-old black male with distinctive white markings born July 1, 2003. His sire is Oshkosh Slammer and his dam is Tamerin. Snoopy was turned into the Tri Cities Shelter because he was "too old to run." 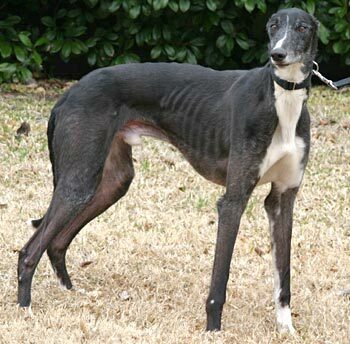 Snoopy's official racing career started March 20, 2005, at Gulf Greyhound Park in La Marque, TX, and finished at Corpus Christi Race Track on February 7, 2007. His whereabouts from his last race until 1/23/08 are unknown at this time. Snoopy is in a foster home with two shelties (and other greyhounds, of course) and has learned to live with small dogs, but as he is still fairly new to a home, will need supervision. We hope to test him with cats soon.